As the largest charitable supporter of T1D research, JDRF is currently sponsoring more than $568 million in scientific research in 17 countries. JDRF is the only global organization with a strategic plan to bring those living with T1D a continuous flow of life-changing therapies and, ultimately, a cure for the disease. JDRF’s highest priority remains funding research to deliver a cure for T1D and its complications. At the same time, JDRF is also focused on developing better treatments that will transform the way people with T1D treat the disease today, in order to help them live healthier lives now and in the future. Finally, JDRF also seeks to prevent T1D, to keep future generations from developing the disease. JDRF-funded research has led to many landmark advances in T1D science. JDRF is now in the exciting position of taking that research knowledge and translating it into real therapies that will make life-changing differences for those facing the daily challenges of T1D. Currently, JDRF is funding more than 50 human clinical trials, several of which are in the advanced stages of clinical testing needed before FDA approvals can be sought. JDRF’s influence and leadership extends beyond funding research. We strategically partner with industry, governments, foundations, academia, healthcare insurers, and clinicians to ensure that JDRF and its partners are aligned and working toward a common goal of a world without T1D. 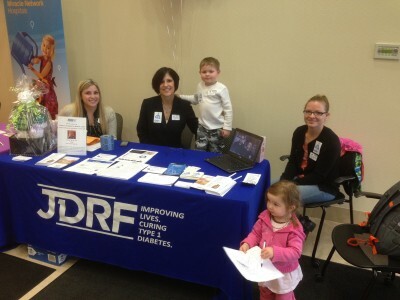 JDRF’s advocacy efforts help support a variety of issues that are critical to JDRF achieving its research objectives. 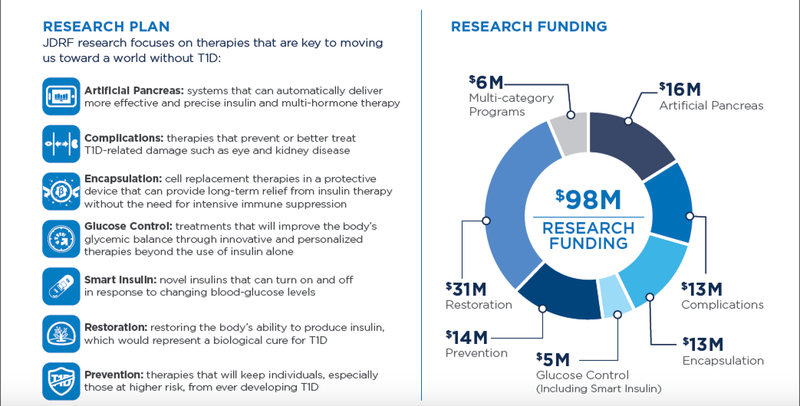 Our focus includes increased government funding for T1D research and a regulatory environment that allows people with T1D to benefit from potential new therapies and devices as quickly and safely as possible. Finally, JDRF’s outreach efforts provide practical support and resources for people with T1D and their families every step of the way as they live with T1D. JDRF has always been dedicated to maintaining the highest levels of efficiency to ensure that our time, resources, and dollars can achieve the greatest possible impact on the lives of people with T1D. We have a solid track record of funding research efficiently and effectively. JDRF was created—and is still led—by people with a personal connection to T1D. Today, volunteers at JDRF’s more than 100 locations worldwide remain the driving force behind our activities. That gives us an unrelenting passion and commitment to work to remove the impact of T1D from people’s lives. Whether it’s providing funding for a late-stage clinical trial, advocating faster regulatory approval of new devices, or partnering with a company on research that might not otherwise receive funding, every decision JDRF makes is driven by our commitment to achieving a world without T1D.